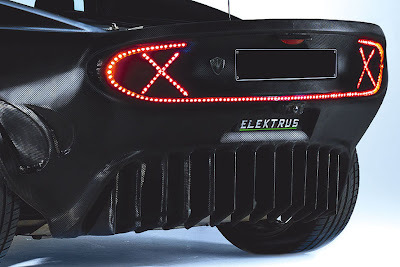 As production of the Tesla Roadster drawing to a close, German Bicycle manufacturer PG has revealed a Lotus Elise based electric sports car called Elektrus which they say will be manufactured in Germany starting later this year. Powered by a 268 horsepower (200kW) electric motor, which also produces 350 Nm (258 lb-ft) of torque from zero rpm, PG claim a 0-60 time of under 3 seconds. 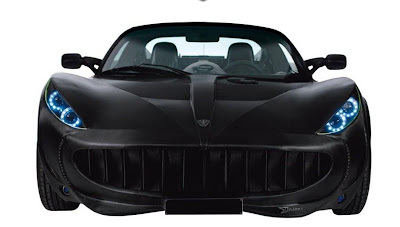 Top speed of the Elektrus is 'limited ' to 155 mph (248 km/h), although PG claim it can supposedly do 186 mph (300 km/h). The PG Elektrus has a range of up to 215 miles (350km) on a full charge – which takes just four hours using a 380V fast charger, or eight hours using a conventional 220V outlet. In addition, a small solar panel located behind the cockpit helps top up the batteries, or runs the audio system and other interior equipment when parked up. The PG Elektrus has a multi-speed transmission which can be switched back and forth between automatic and manual modes. (are PG destined to repeat Tesla's multispeed gearbox debacle?) For drivers who might miss the sound of a conventional internal combustion engine, the audio system can replicate the soundtrack of a V8 burble, or the scream of Formula-One racer. Look for the vehicle to land with a gasp-inducing price tag of $367,700.